Teacher Certification at the National academy of Needlearts (NAN) requires an expertise piece for final graduation. It is to demonstrate one’s prowess as a stitcher and designer. For this challenge I created Autumn Splendor. Autumn in Michigan is magical. The lush green trees, under the influence of the shorter days and frosty temperatures shed their chlorophyll and reveal the colors hidden all summer long. Almost over night they blaze fiery crimson, radiant orange and brilliant yellow, thrilling the eyes of all who behold them. Even the acorns take on luminous hues, easily overlooked among the spectacular leaves around them. In Autumn Splendor, I drew my inspiration from the many oak leaves and acorns in our nearby woods. When studied closely, they vary significantly in size, shape and color. 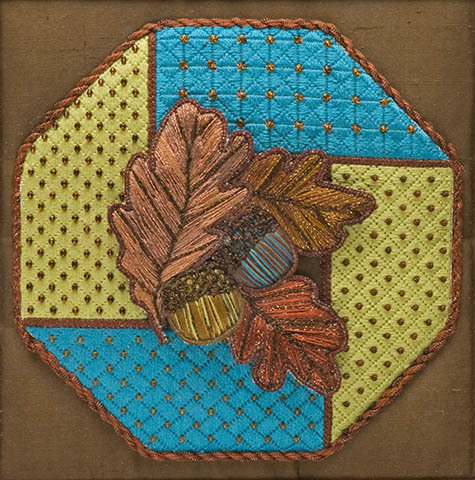 As the acorns form and appear “green” to the casual observer, they actually have many colors, some of which I chose for this piece of embroidery. These colors are enhanced when placed on a background of bolder color. Autumn Splendor was chosen for inclusion in the permanent collection of the National Academy of Needlearts, at the completion of Level II Certification. This is the highest honor that can be bestowed on a candidate.